I have another delicious 30 minute beef meal that is perfect for a busy school night. This recipe does involve a 6 hour or overnight marinade. Just assemble the marinade the night before to make life easy. It is healthy at only 350 calories per serving and packed with protein. Each serving is an excellent source of iron, vitamin B6 and B12 as well as zinc. My kids had a lot of fun helping assemble the veggies on the wooden skewers. They really seem to enjoy the foods we make together more than the foods they do not help me assemble. They are excited to see what their hard work creates and eat and enjoy. 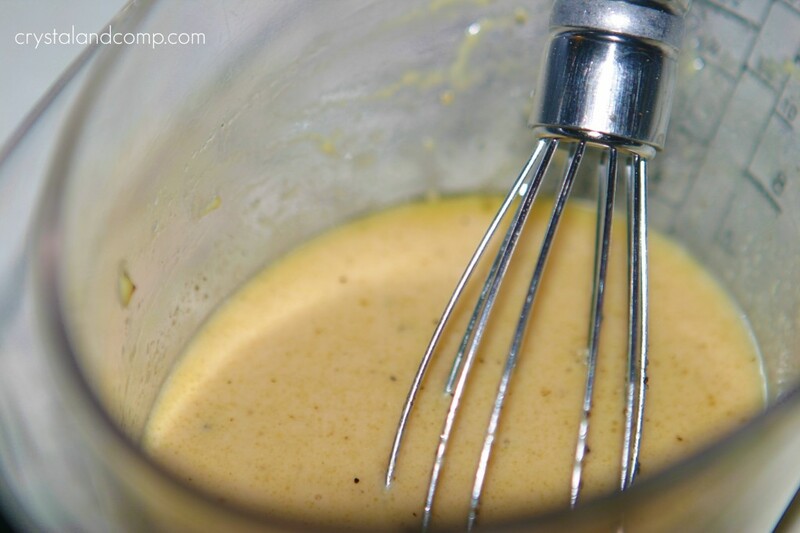 Whisk together the 2 T water, the red wine vinegar, mustard, garlic, 2 t vegetable oil and pepper. Toss the steak into a ziplock bag and pour the marinade over the steak. 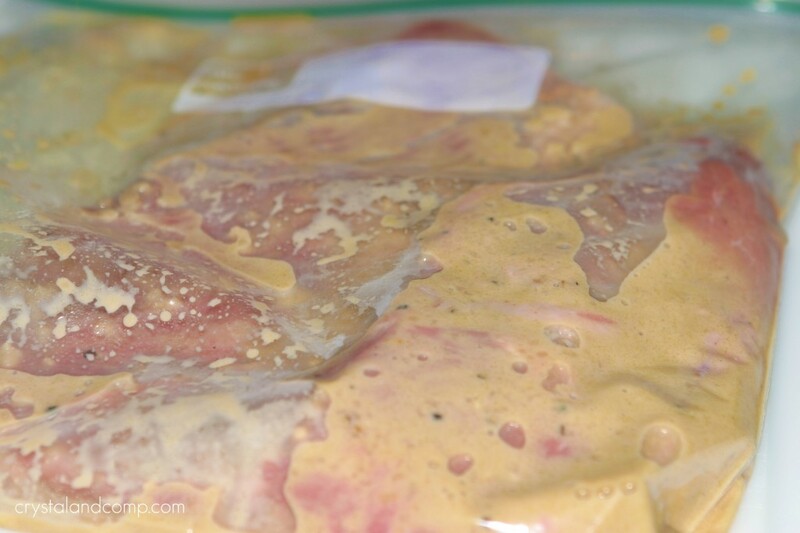 Seal it up and marinate for 6 hours or over night in the fridge. After the steak has marinated take it out of the fridge. 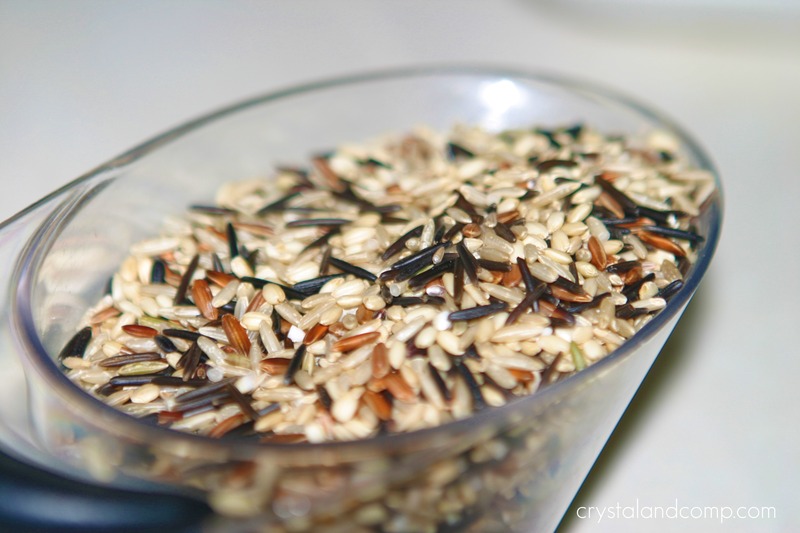 Go ahead and start your wild rice and cook according to the box directions. These kabobs cook very quickly, so start your rice before you assemble the kabobs. Optional rice changes: I prefer to use butter with my rice opposed to the oil. I also prefer to use chicken stock instead of water. Add in some fresh chopped mushrooms as well for added flavor that will marry perfectly with the kabobs. Now that you have your rice going you can move on to the kabobs. Remove the steaks from the ziplock bag. Dice them into 1 inch by 1 inch squares. Dice up the veggies. Matthew loved watching me do this. He even separated the onion wedges on his own free will. I could not get him to stop. I told him his hands would stink, but he was having too much fun. We washed his hands immediately. 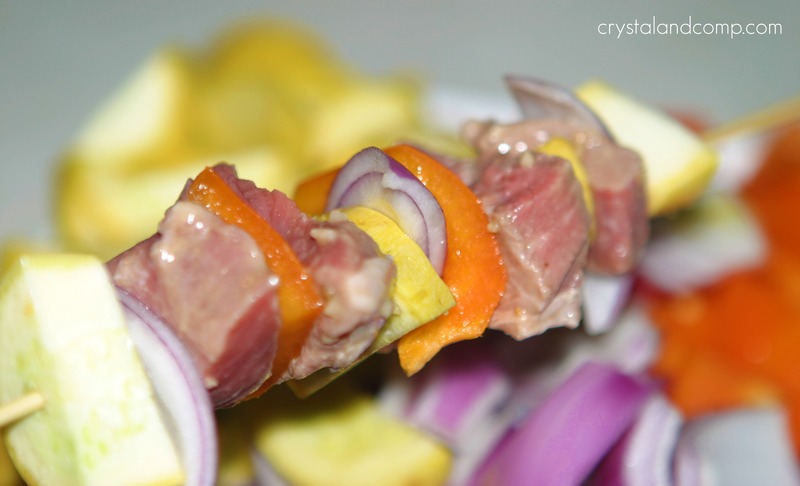 Assemble the skewers alternating veggies and beef. I think I ended up with 9 full kabobs with all of the veggies and meat. Each child only ate one kabob, so we had leftovers. It was storming here when it was time to grill, so I used my indoor grill. Cook them for about 8-10 minutes. The marinade caramelized on the beef during the grilling process. By the time your kabobs are done cooking, the rice will be done. 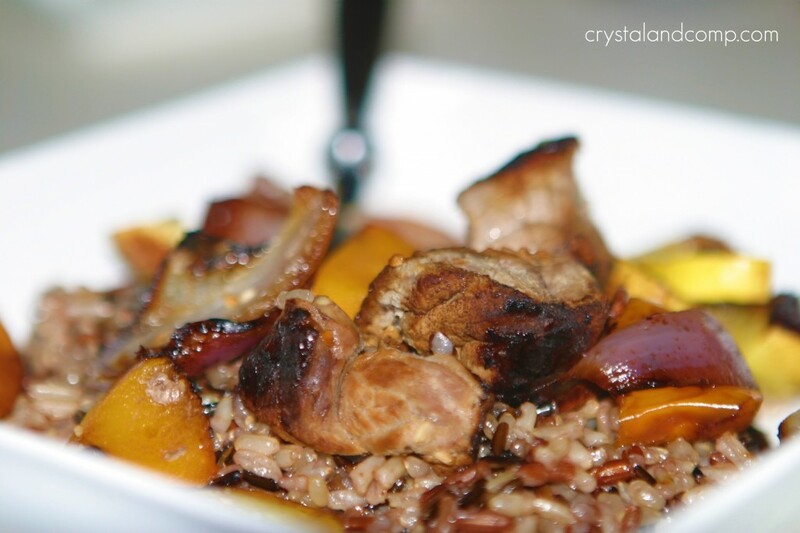 Serve each kabob over a bed of mushroom wild rice. I also served with fresh grapes as an added side for the kids. Kabob tip: soak the wooden skewers in water for 10 minutes before assembling. This is especially helpful with cooking the kabobs over a gas grill to prevent charred skewers. You can view the original recipe over on the Texas Beef Council site where they share more detailed nutritional information about this entrÃ©e. 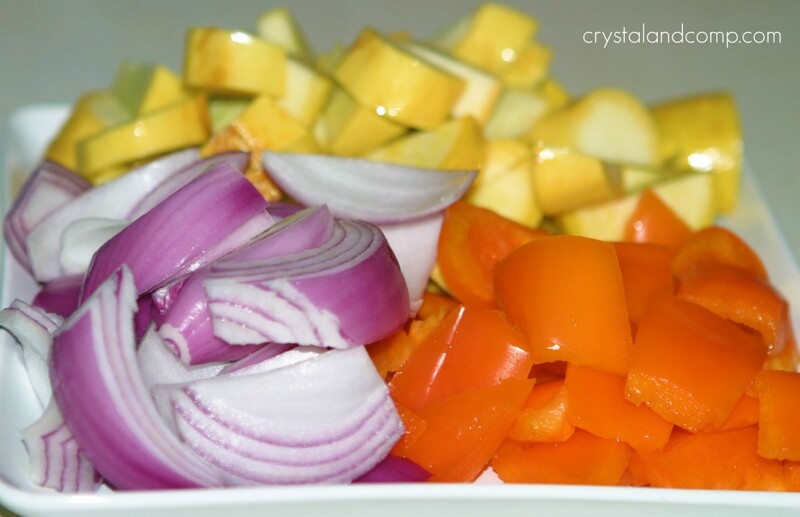 And don’t forget, Crystal & Co., has a nice index of easy recipe that are perfect for busy school nights. Many are crockpotable or 30 minute cook time or less. If you would like a plethora of beef recipes, check out our Fuel for the Family board over on Pinterest. This recipe does involve a 6 hour or overnight marinade. Just assemble the marinade the night before to make life easy. It is healthy at only 350 calories per serving and packed with protein. Each serving is an excellent source of iron, vitamin B6 and B12 and zinc. Toss the steak into a ziplock bag and pour the marinate over the steak. 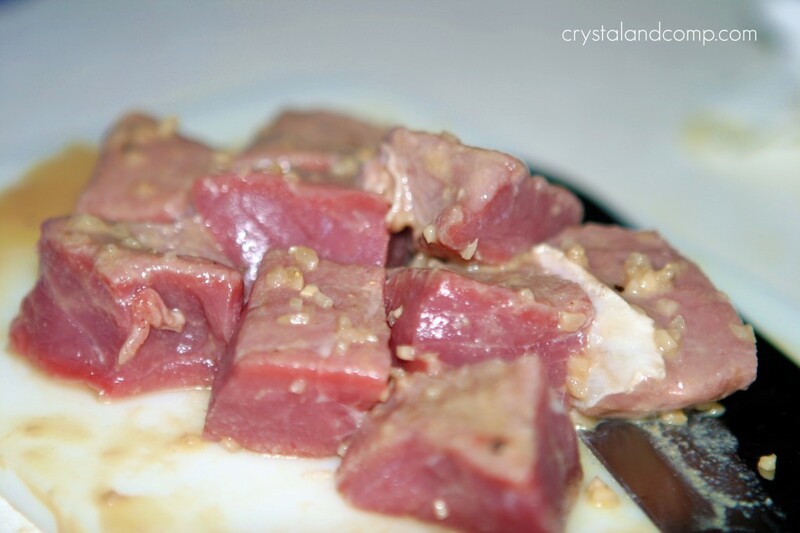 Seal it up and marinate for 6 hours or over night in the fridge. Go ahead and start your wild rice according to the box directions. 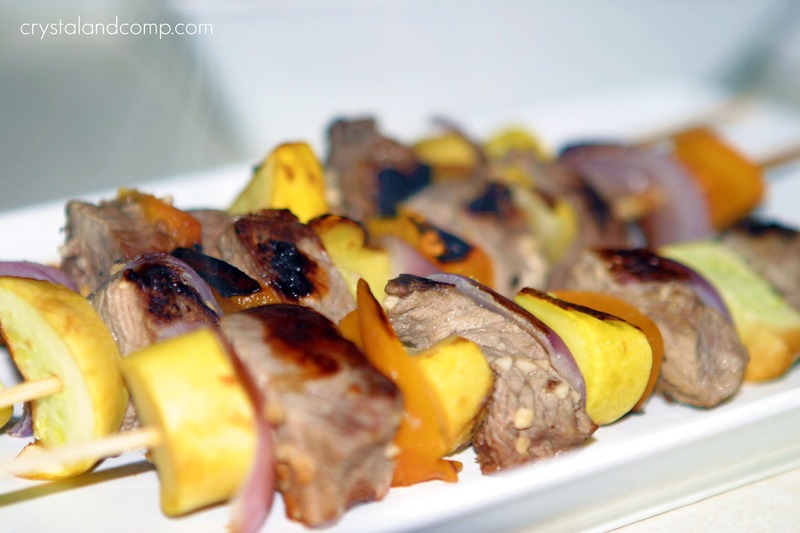 These kabobs cook very quickly, so start your rice before you assemble the kabobs. Now that you have your rice going you can move on to the kabobs. Remove the steaks from the ziplock bag. Dice them into 1 inch by 1 inch squares. Place the kabobs on the grill. Cook them for about 8-10 minutes. By the time your kabobs are done cooking, the rice will be done. 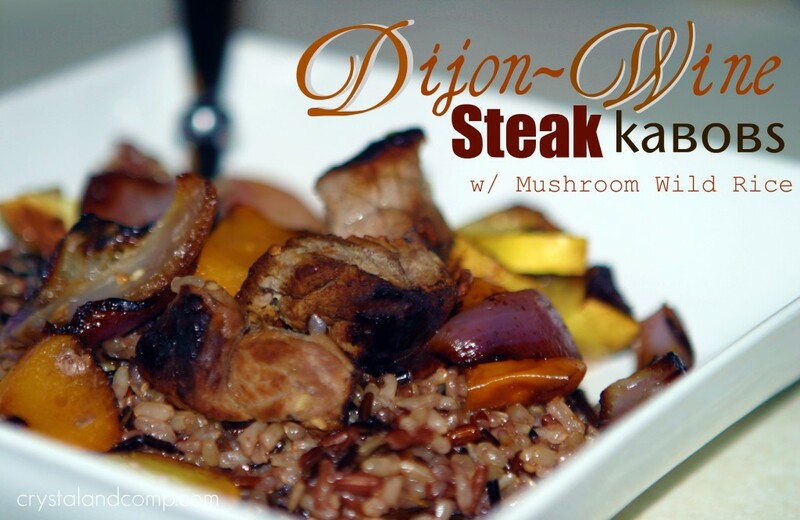 Serve each kabob over a bed of mushroom wild rice. Optional rice changes: I prefer to use butter with my rice opposed to the oil. I also prefer to use chicken stock instead of water. Add in some fresh chopped mushrooms as well for added flavor that will marry perfectly with the kabobs. Grilling notes: It was storming here when it was time to grill, so I used my indoor grill. It worked perfectly. Kabob tip: soak the wooden skewers in water for 10 minutes before assembling. This is especially helpful with cooking the kabobs over a gas grill to prevent charred skewers. Thanks Melissa! Glad you like it. It was very tasty and being healthy made it a plus. I also love that is came together so quickly. This looks amazing. Your photography of this is incredible! Yum, Yum!! This looks delicious! I love mushroom rice. CONGRATULATIONS!! !Your recipe is being featured on Today’s Menu Round Up! These look amazing! 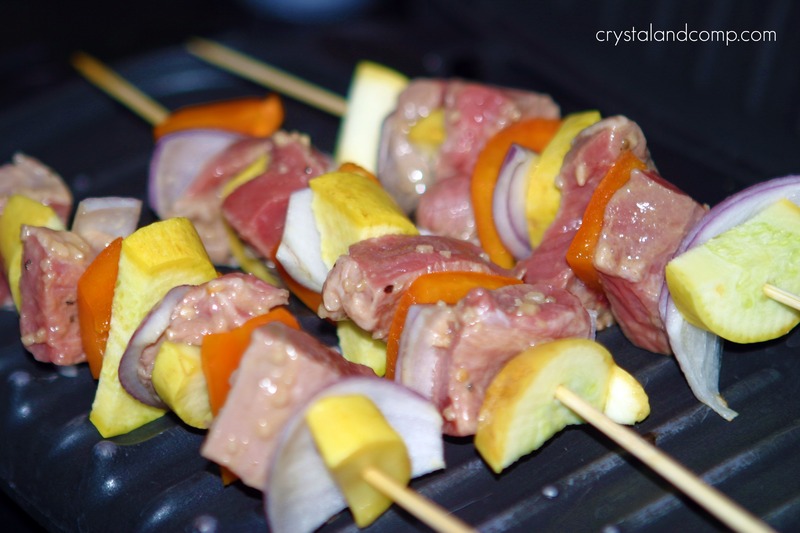 Kabobs are my irtoafve meal on the grill during summer, so I go through major withdrawal during winter. Not anymore! So glad to have discovered you and your blog via dooce community. I’m a southerner (raised by Yankees, too, actually), and I can definitely appreciate our region’s food not being typecast in Paula Deen style. Plus, amen on the Bojangles biscuits! The ONLY thing that got me through my pregnancy. This looks so good! I love kabobs! Thanks again for linking to What I Learned Wednesday! I hope to see you again at the link party tomorrow!